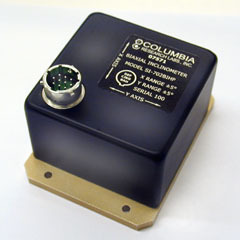 The Columbia Model SI-726BIHPC is a biaxial force balance inclinometer designed with an output circuit configuration made for use in 4-20 mA data transmission systems. The 4-20 mA system is used extensively in industrial installations in order to transmit data over long distances in environments where interference from nearby electrical power lines could be a problem. The Model SI-726BIHPC incorporates Columbia's patented HP suspension system and special desensitization circuitry allowing this device to provide accurate tilt data while in substantial vibration environments. This sensor is intended for applications such as platform stabilization, surface mapping and measuring tilt angles in remote locations. Consult the factory for customized versions of this sensor.